Uncle Sam wants you...to take over his duties so he can go on vacation. You know, Uncle Sam wasn’t the first to personify the United States. No the very first was a female iteration named Columbia, who first appeared in 1738. She was often associated with Lady Liberty. Then came Brother Johnathan, sometime during the American Revolution. Then, during the War of 1812, we finally met Uncle Sam. And since then he has meant a lot of things to a lot of different people. For some, he embodies the government. Others feel he is like the spiritual brother of the United States. Sometimes he is a recruiter for the armed forces. And once a year he is a guy walking on stilts through the Fourth of July parade. This year he could be you! With this Men's Deluxe Uncle Sam Costume, you can be the next one to personify the United States. You can call your brothers, and sisters to war (but only if you need to). Or, you can ask the girl dressed as Columbia (or even Lady Liberty) to dance at the Fourth of July picnic. Then watch the fireworks together. Either way, don't do anything that would bring shame on the United States (like blowing something up with firecrackers) as you are dressed up as our favorite Uncle. Nobody needs the PR nightmare of cleaning up after Uncle Sam. Maybe just hang out with Brother Johnathan during the Independence day festivities. Best costume winner among 500+ entrants! Gotta wear mirrored shades with it. Very nice, well made and it was a hit. People loved it. thank you. 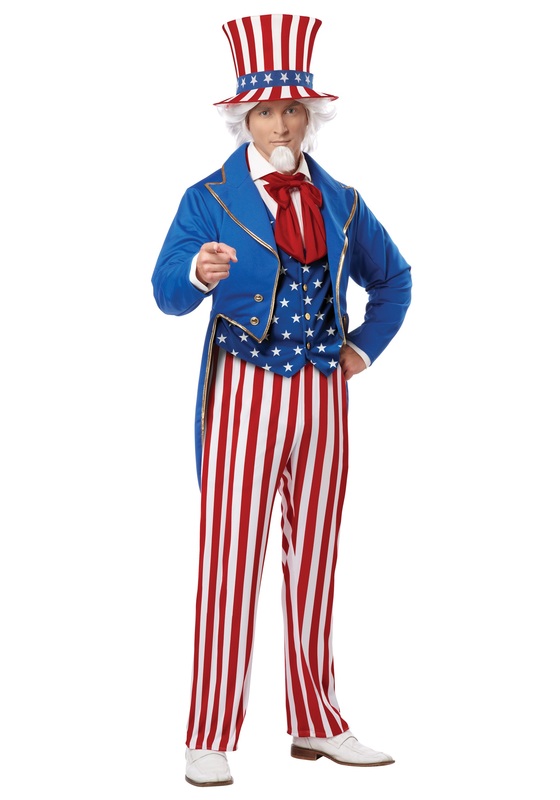 I am running for political office and thought it would be fun to dress up like Uncle Sam this year for Halloween. I am also going to use in a Veteran's Day parade. Looks great - pants are not long enough but I figured that was going to be the case so I am going to see a blue cuff on the bottom. Good quality for the price! My uncle Sam costume was great and I loved it.